Like to dance in the rain? Every year, storms roll across our cities—rain storms, snow storms, hail storms, etc. That’s why most of us keep the Weather Channel bookmarked and ready on our computers or phone. We know how important it is to stay up-to-date on the latest weather news. So what’s the weather like in your city today? We’ll be talking about terms you need to describe those sunny days, stormy days, and all those in between. But before we get into the vocabulary, let’s see why weather is such a hot topic with so many people. 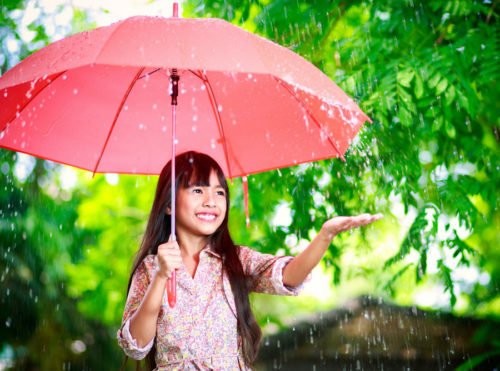 Why Learn to Talk About the Weather in English? Have you ever noticed how people seem to love talking about the weather? Whether they’re standing in the grocery checkout line or meeting new people at a party, the weather is quite the popular conversation starter. Even at more formal occasions, like business meetings or other professional settings, weather is a popular topic for small talk. That might be due to the fact that the weather is often different from day to day and from place to place, making it a relevant subject for everyone. To fully participate in these conversations, you’ll need lots of English words and phrases in your vocabulary. Also, knowing weather-related terms is important for your safety! Imagine you’re in a local restaurant and the waiter casually tells you, “Be careful of that fog when you go over the bridge.” You’ll be glad you know what the word fog means! There are so many adjectives you can use for describing the weather. Some of them are very similar in meaning (i.e., hot and warm) and a little harder to distinguish, while others are completely different (i.e., rainy and sunny) and easier to remember. In addition to learning these terms, you should consider practicing them often. FluentU is a great resource for that. FluentU takes fun videos like music videos, movie trailers, news and inspiring talks, and it turns them into English lessons. FluentU does this in two ways. First, you can watch videos with helpful captions. When you click on the captions, you can see images, definitions, example sentences and even examples of the word in other videos. So after you’ve learned these words, make sure you practice them frequently with FluentU! Now let’s get to those common terms you’ll need to talk about all kinds of weather. When we say it’s hot, we’re referring to very high temperatures, like you find in the middle of summer when the heat can get quite uncomfortable. When it’s warm though, temperatures are fairly high but bearable. When the weather is warm, I prefer light clothing like t-shirts. Today is so hot that I’ve been sitting under the fan all day. Cold refers to very low temperatures, close to freezing—the type of weather that requires a heavy coat to go outside. With cool, however, we’re talking about fairly low, spring-like temperatures when you may only need to wear a sweater out. On cool days like today, you should be fine with a light jacket. Don’t forget your coat; it’s cold outside. Sunny weather means there’s lots of sunshine. Its opposite is rainy weather, which means lots of rain. On sunny days, I like to take the kids to the beach. Rainy days are the best time to stay home and read a book. A clear day is bright with no signs of bad weather. A cloudy day, however, means the skies are filled with clouds with little or no sun. Isn’t it great that we’re having such clear days this week? It looks cloudy; you should bring an umbrella in case it rains. When it’s dry, there’s no rain or moisture in the air. But when it’s humid, the air is moist and contains a large amount of water vapor. Humid weather usually makes us perspire (sweat) more. Bush fires are common around here when the weather is dry. The weather’s been so humid lately it’s impossible to go outside without breaking a sweat. These two adjectives refer to hazy conditions caused by small droplets of water in the air that make it difficult to see. Fog (noun) forms closer to the ground and is thicker and more difficult to see through. Mist (noun) usually forms on hills and mountains and isn’t as thick. Be sure to turn on your headlights when driving through foggy areas. It’s misty up in the mountains in the mornings. These adjectives describe the wind. Gusty suggests a sudden brief burst of wind while windy refers to a stronger than usual wind blowing. It’s been gusty all afternoon and my umbrella was blown away. As we were walking along the beach, it started to get windy. These two nouns are often used together when referring to storms. Thunder is the loud booming sound which usually follows a flash of lightning in the sky. Whenever there’s thunder and lightning, my dog rushes into the house in fear. Whether you’re at the coffee machine or waiting your turn at the post office, chances are you might get into a casual conversation with the person next to you about what’s going on outside. Here are some phrases to help you prepare. How’s the weather? / What’s it like out there? Both of these are good questions to ask if you haven’t gone outside in a while, and you’re wondering if things have changed. Or maybe you’re still debating about whether or not you want to venture (go) outdoors, so you might ask this to someone who comes inside. What’s the temperature like (out there)? If you’re planning a trip or event, you might want to know the weather ahead of time. Forecast simply refers to what kind of weather is expected in the coming days or weeks. Use other adjectives like nice or gorgeous to make your descriptions more interesting. It’s [warm and sunny] outside. This is a simple sentence using two or more descriptive adjectives. It’s warm and windy outside. There’s nothing but blue skies outside. We couldn’t ask for [better] weather. Here the use of the comparative adjective better suggests that the weather is so good that it couldn’t get any better. You could use other comparative adjectives like nicer or more beautiful. We couldn’t ask for nicer weather this week! This is the (best/worst) weather we’ve had all [season/week/year]! This is the most beautiful weather we’ve had all week! This is the worst weather we’ve had all spring! Using the question form can be quite refreshing especially when you expect the person to agree with you. You could use similar adjectives like nasty or terrible instead. Nasty weather today, isn’t it? The word boiling is used here as an adjective, not as a verb, to create an image of how hot it is. You could also use adverbs like extremely or really. In this simple sentence, you may use any verb in its -ing form to describe the weather such as pouring (raining very heavily) or sizzling (very hot). I can’t believe this [weather]! Here’s a simple way to express your surprise. Feel free to use any other suitable noun such as storm or wind. This is a popular idiom (expression) for saying that it’s raining heavily. Have fun with it. Here you’re saying it looks like it might rain in the near future. It could be that you can see dark clouds or hear thunder. You could use other nouns like snow or a storm. [A storm] seems to be [coming/heading] this way. Heavy rain seems to be heading this way. The weather will be warming up soon. The weather will be cooling down soon. It’s expected to be [hotter] than last year. The phrase expected to be suggests that you think it’ll happen. Use a comparative adjective here to compare the weather now with another time in the past. You could use other comparative adjectives like colder or less windy. So there you have it—a great list of weather words and phrases to get you talking about the weather like a native speaker. I expect you’ll warm up to (get used to) these sentence structures pretty quickly and use them in your own words.